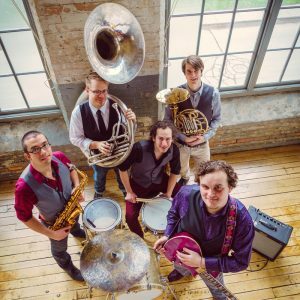 With a performance style rooted in the New Orleans horn band tradition, Turbo Street Funk combine Top 40 hits with top notch originals. Whether they’re playing a festival, pub, concert hall, or even on a busy street corner, the infectious sounds of Turbo Street Funk get people moving and grooving. “…Turbo Street Funk have become a fixture on Toronto’s sidewalks. The band quickly drew the attention of Canadian jazz legend, Richard Underhill, who introduced them to fellow “Shuffle Demon” and music producer, George Koller. 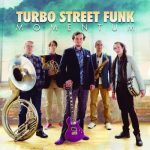 With George at the helm, Turbo Street Funk released their debut album, To The Street, in May 2014 at Toronto’s legendary Horseshoe Tavern. Tracks from the album have been featured on Jazz FM.91, CBC Radio 1, and campus and community radio stations across Ontario. The album features unique artwork and design from JUNO Award Winning graphic artist, Michael Wrycraft. Since To The Street’s release, Turbo Street Funk have grown from a street savvy busking crew to a collection of dynamic showmen, performing at festivals across Ontario including the Mariposa Folk Festival, Beaches International Jazz Festival, Toronto International BuskerFest, Brampton’s 2015 Canada Day celebration in Chinguacousy Park, Hamilton Blues & Roots Festival, Cultura, Creemore Springs Copper Kettle Festival, and many more. Turbo Street Funk was invited to perform at Jazz.FM91’s Jazz Lives at Toronto’s Koerner Hall in 2015. The band opened for Terra Lightfoot, Boris Brott and the National Academy Orchestra at the PANAM Supercrawl and Cultural Showcase in Hamilton.